The big picture for UK companies and foreign investors interested in the Polish market; key macroeconomic indicators updated at the end of each month - keep this page bookmarked and visit monthly. 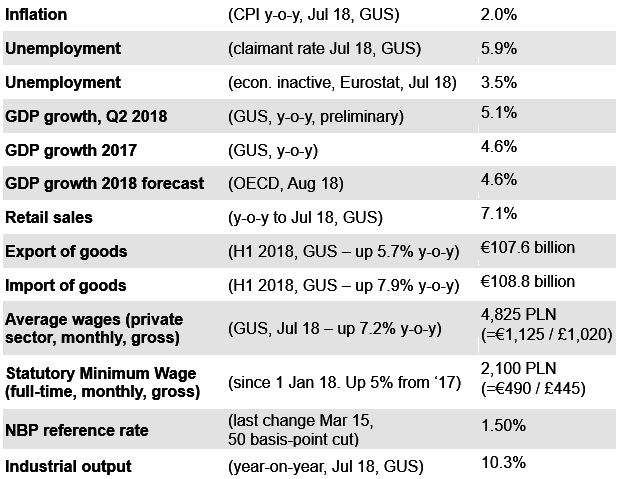 It looks like Poland has just passed the peak of its current economic cycle, with annualised GDP growth slightly lower in Q2 (5.1%) than in Q1 (5.2%), and expected to slow down a touch more in H2. Still, by Western European standards, growth will remain impressive, with current whole-year forecasts for 2018 at around 4.5%. Growth into next year is expected to be somewhat slower, with forecasts ranging between 3.4% and 3.6%. Poland’s most recent GDP growth figures are impressive. Q1 2018 year-on-year growth accelerated to 5.2% from 4.9% in Q4 '17; previous quarters of 2017 noted growth of 5.2% (Q3), 4.0% (Q2) and 4.4% (Q1). Construction has been leading the charge, but the stellar growth seen in June 2018 (24.7%) is begin to slow (18.7% in the year to July 2018) This is still strong, but the deceleration is noticeable. Macroeconomic forecasts for the whole of 2018 have now stopped becoming increasing bullish with each passing month, which has been the case until now, and are topping out at 4.6%. However, a major limiting factor to growth is perceived as shortages on the labour market. It looks certain that Q1 2018 will be the high-water mark in growth in the current economic cycle. An upturn in investment as a part of the GDP growth mix towards the end of last year balanced the economy, as private consumption had been seen as the dominant macroeconomic force, buoyed up by export production. Registered unemployment hit a record low in June 2018 of 5.8%, before nudging up to 5.9% in July. Yet the Eurostat measure, looking at economic activity rather than the claimant rate, was 3.5% in July 2018, down two percentage points over the previous month, suggesting that over third of those registered as unemployed have been working in the cash-in-hand sector, that number increasing over the summer. Concerted efforts by the Ministry of Finance to close down VAT loopholes (which resulted in 53.4 billion zlotys of foregone revenue in 2015) are proving effective. Last year, deputy premier (now premier) Mateusz Morawiecki claimed to have clawed back some 15-17 billion złotys in 2016. This year will see a further tightening of measures against the grey economy, as micro-businesses will be obliged to file their VAT returns online in the Single Audit File for Tax (SAF-T) format from 1 January. Voluntary split payment of VAT was introduced on 1 July (for B2B transactions only), causing concern about the liquidity of small businesses whose cash-flow will be affected. Concerns about the effects of political interference in the markets remain present among foreign investors in a number of sectors – retail and logistics. The law restricting Sunday trading, which comes in force in steps (from two Sundays a month in March 2018). In the pharmaceutical sector, there proposals to limit advertising and selling OTC remedies. The construction sector still has issues with ease of obtaining planning permissions and poor public procurement procedures. An increasing worry among foreign investors regarding the independence of the Polish judiciary concerns the legal fair play in cases where they may be facing the Polish state or state-owned enterprise in court. This is not a major worry for foreign investors who have come to Poland to make car parts or process food; if the client/customer is in the private sector, cases involving the state are rare. But foreign-owned construction firms engaged in major infrastructure projects for the Polish state are concerned that court cases between them and the public-sector contractor might not be fairly adjudicated. There is a feeling that courts where the judges take instruction from politicians will be biased against foreign capital; this will dissuade foreign owned companies from taking on public tenders and leaving them to Polish firms. With less competition on the market, the Polish taxpayer may end up paying more for infrastructure projects of lower quality. Remaining sectors of the economy, however, feel generally untroubled by political risk, and inward investment from the UK looks likely to rise as investors seek a high-skilled but lower-cost labour force within the EU. BPCC members in sectors such as HR and real estate report rising interest in UK-based businesses with US, Japanese or Indian capital looking for a secure base within the EU. Inbound foreign investment rose in 2017, according to the National Bank of Poland, continuing an upward trend visible since 2012. Questions that investors will be looking at closely: will the 2019 budget be able to withstand the higher social costs of the 500+ child-benefits programme, a lower retirement age and any other pre-election social giveaways? Will the prime minister’s plans to simplify bureaucratic procedures for small business boost growth and counterbalance the additional social costs? Will the impending departure from the single European market of what was once Poland’s second-largest export destination hit its industrial production and GDP? Will the Ministry of Digital Affairs be able to deliver an ambitious e-administration project? Poland has a strong, diverse and sustainable economy, based on the three strong legs of public and private investment, growing exports of manufactured goods and robust domestic consumer demand, together with manageable private-sector borrowing. Looking ahead for the next 15-20 years, Poland's economy has the potential to continue to grow at a faster pace than that of western Europe, a point made in McKinsey & Company's recent report Poland 2025: Europe's New Growth Engine. Polish exports – linked to a great degree to Germany’s export powerhouse – will continue to grow at a faster pace than its GDP. American strategic analyst George Friedman in his books The Next Hundred Years and The Next Thirty Years posits that Poland will be one of three or four countries that will grow into a regional power during this century. The fact that Poland reoriented its exports away from Russia and towards the EU back in the 1990s – and increasingly these days towards emerging markets – made its economy resilient to the shocks caused by the continuing Russian trade embargo. Poland is home to very little Russian investment and has only minor investments in Russia. While Polish exports to Russia are down by around a third compared to their levels in 2014, Poland has nonetheless managed to increase the value of overall exports over that same time. Before the Russian invasion of Ukraine, Russia was Poland’s second-largest trading partner after Germany; now (Q1 2018) it has slipped to seventh place. The effects of the conflict in Ukraine on Polish companies trading with Russia and Ukraine are easing as many have found alternative markets. Trade with Russia has long been haphazard, with embargoes on food exports, additional tariffs or non-tariff barriers being imposed then lifted at the drop of a hat. Exports to Russia have slowed (they currently represent just 3.0% of Poland's exports compared to 5.3% in 2013). The opening of the LNG terminal in Świnoujście has reduced Poland’s dependence on Russian gas. Poland will be receiving over €83 billion from Brussels in the form of structural and cohesion funds for the 2014-2020 EU budget perspective, of which some €28 billion has been earmarked for transport infrastructure (with a marked focus on rail). This – like money from the 2007-2013 budget – will have a significant positive impact on the Polish economy, and will greatly improve transport around the country, to the benefit of business. However, the absorption of the funds is complicated by the new rules that have been introduced with the new budget perspective, along with changes of staff across the ministries that followed the 2015 parliamentary election. Manufacturing output has bounced back strongly since the autumn of 2016; mainly driven by exports. Being Germany’s manufacturing outsourcing backyard, Poland’s industrial production is heavily dependent on Germany's export-led economy. Germany now accounts for 27.4% of all Polish exports; German importers are taking up the slack from foregone sales to Russia. As well as Germany, the UK and Czechia have also seen significant rises in imports from Poland. Trade figures for 2017 show that Poland's exports and imports of goods are finely balanced, with a wafer-thin trade surplus of €0.4 billion. The two-and-half-year deflationary run that Poland has experienced since July 2014 came to an end, with consumer price inflation breaking into positive territory in December 2016, followed by a significant jump to 2.2% in February 2017, then holding around that level (2.0% in June '18). Wages, however, had been rising faster, with 7.5% growth in the private sector pay in the year to June 2018. The 5.0% increase in the statutory minimum wage on 1 January 2018 (from 2,000 zł to 2,100 zł) is working its way into the wage inflation figures. The Monetary Policy Council started loosening money supply by lowering base rates from a high of 4.75% (May 2012). In November-December 2012 and January-February 2013, the MPC made four consecutive 25 bp cuts, followed by a 50 bp cut in March 2013 and a further three 25bp cuts in May, June and July 2013, in response to weakening inflationary pressure. After three months of negative inflation, the MPC made a 50 bp cut in October 2014. The most recent cut was announced on 5 March 2015, and base rates have stayed at 1.5% since. Poland’s largest age cohort, born in 1983, will reach the age of 35 this year (all 690,000 of them); this is Poland's demographic high-water mark. By contrast, the number of 15-year-olds, born in 2003, is a mere 350,000, the low-water mark. Over the next several years, the number of young people entering the labour market will continue to fall by an average of 17,000 a year, as it has done for the past decade or so. The turnaround will happen when the 2004 cohort starts joining the labour market between 2023-27. However, the high quality of secondary education in Poland continues to encourage the BPO sector to invest in service centres in Poland, as does the high level of foreign language proficiency among younger Poles (Poland was ranked 11th in the world in the 2017 English Proficiency Index by language training company EF, with ‘high’ proficiency – a similar level to Germany, Austria or Belgium). The shock to national accounts of large numbers of post-war baby-boomers hitting pensionable age in the early part of the next decade (65-year-olds born after 1952) will be made worse by the extremely low number of Poles of pre-pensionable age in the labour market. Only 28% of Poland’s over-55s are economically active (compared to 58% in the UK). The Tusk government raised the retirement age to 67 for men and women, though the current government has pledged to return it to the previous 65 for men and 60 for women. During the four and half years from February 2004 to October 2008, registered unemployment in Poland fell faster than in any major economy ever in peacetime, from 20.4% to 8.8%. This level was unsurpassed until June 2016. The global financial crisis might not have pushed Poland into recession, but the economy certainly felt the strain. By March 2013, unemployment had reached 14.3%, a new high-water mark, before starting to fall, down to 5.9% in June 2018. However, Eurostat says that Poland's unemployment, measured by economic activity rather than registered joblessness, stands at 3.8% (June 2018), suggesting that a third of those signed on are actually economically active working cash-in-hand within the grey sector. Eurostat's May 2018 figures mark a historic moment, when, on a like-for-like measure, unemployment in Poland has actually fallen below that in the UK (4.1%). Compared to the situation in the UK, western Europe and the USA, Poland's unemployment is lowest in the cities and highest in rural areas, with more than half of the long-term unemployed living in villages. There remain massive regional disparities between cities where unemployment is very low (Poznań 1.3%, Warsaw 1.7%, Katowice 1.8%, Wrocław 2.0%, Kraków 2.5%, Gdansk 2.7% in July 2018) while in many small provincial towns it remains stubbornly in double digits. Szydłowiec, some 120km south of Warsaw, also in the Mazowsze province, holds the record at 23.5.%. Nearby Radom, a city of 200,000 people, also has high unemployment at 12.2%. Fruit-growing Grójec poviat south of Warsaw has just 2.2% unemployment, reflecting the difficulties that employers have in finding fruit pickers. Regional differences in unemployment will play in important role in the government's new industrial strategy, in which investment will be directed by subsidies and tax incentives towards areas of higher unemployment. Investors might wish to consider university cities such as Kielce, Lublin or Łódź, where unemployment is 5.5%, 5.7% and 5.9% respectively. Although Poland had notionally signed up to joining the eurozone as part of its EU Accession Treaty, there was no mention of when, nor at what rate. To do so, Poland must first alter its constitution accordingly, which needs a two-thirds parliamentary majority. The current government is even more reticent than its predecessor to enter the eurozone; there is no pressure from the European Commission for Poland to do so. The euro crisis has put any discussion of Poland abandoning the zloty on hold for the foreseeable future. Poland, therefore, lingers on the fringes of the EU’s central core – and – importantly for its manufactured exports – it can control the competitiveness of its currency. The zloty, which had been rising rapidly in value against the pound, the euro and dollar in the four years after EU Accession, suffered a major depreciation in the aftermath of the October 2008 financial crisis. Between August '08 and February '09, the zloty depreciated by nearly 40% against the euro. This made Poland far more competitive for inward investment and for export, and was one of the key factors that kept Poland out of recession. Since February 2009, the zloty climbed back, though not to the unsustainable level of 3.20 zł = € experienced in August 2008. Throughout 2010 and into 2011 the zloty held steady at around the 4.00=€ and 4.50=£ marks. The euro crisis, however, have knocked the steam out of the zloty's stability. The wobbles on the markets caused by the threat of sovereign defaults in the eurozone and Hungary hit the zloty, knocking it back to 4.50=€ and 5.45=£. For much of 2012, however, the zloty has rebounded somewhat, stabilising at around 4.20=€ and 5.00=£ throughout 2013 and much of 2014. The Ukraine crisis barely affected the zloty's stability vis-a-vis the euro. However, uncertainty as to the economic decisions being made by the new PiS government weakened market sentiment towards the zloty, which reached a low point of 6.09 against sterling in early November 2015. But then the Brexit referendum resulted in a dramatic fall in value of the pound. It remains around 4.75 złotys; the euro around 4.30 złotys. Trade between the two countries has been grown consistently since the end of communism, accelerating significantly since Poland joined the EU. Expressed in sterling terms, 2017 was a record year for British-Polish bilateral trade ever; the value of trade in goods was £15.8 billion, over five times as much as before Poland’s EU accession. Last year, UK exports to Poland rose by 19.6% (to a record £5.1 billion) and Polish exports were up by 14.8% (to a record £10.7 billion). However, this is UK data in sterling; the fall in the value of the pound means that UK exports to Poland became more competitive, while Polish exporters gained at the expense of goods from the eurozone. Poland has a large trade surplus with the UK (in 2017 it was €8.2 billion – only with Germany does it have a larger one, at €8.3 billion). Brexit uncertainty slowed the growth of trade between the UK and Poland. Bilateral trade between Poland and Czechia now exceeds that with the UK. Meanwhile the UK has slipped from eighth to eleventh place in the ranking of Poland’s import sources; it is currently Poland’s sixth-largest bilateral trading partner (after Germany, China, Czechia, France and Italy). GUS, the government's central statistical office, has a small section in English that offers some indicators.